New addtion to the Entity series coming soon. Introducing the Entity Percussion Synthesizer. The Entity PS is focused on a wide variety of snare, clap, snaps, rim shots and synth percussion sound design. The major parameters for Body, Pitch, FM CV and Ring are similar to the Entity BDS. A multimode noise source is included with independent decay and amplitude modulation. The resonator core features independent decay control, trigger delay and dynamic control. A harmonics (wavefolder) section replaces the saturation stage of the Entity BDS. 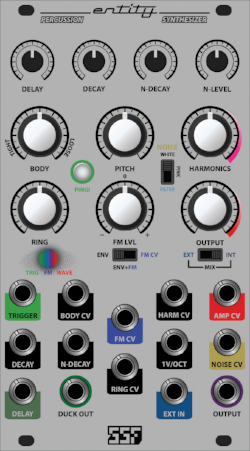 The output section features a mix selector where the user can choose to use the resonator, an external input via the EXT IN jack or a mix of the two. All features are voltage controllable and a duck output for the main sound is also included. We are very happy with the range of sound possibilities of the Entity percussion Synthesizer and hope you will be too! We remain focused on continuing the analog legacy by producing modern, 100% analog designs.